A big storm caused damage of electricity in a small village. Help villagers and restore lighting in every house in the village! After big storm a small village have problems with lighting. 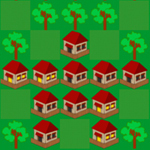 Help villagers and restore lighting in every house in the village! Use your brain and logic and solve puzzle on every level with minimum of moves. Click a house to turn on / off lighting in it and in its neighbours.